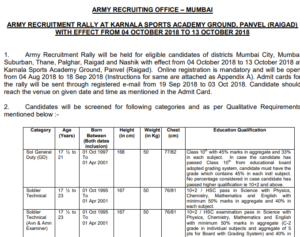 Army Recruitment Rally at Karnala Sports Academy Ground, Panvel, Raigad – Disclosed in the Appendix ‘B’, India Non-Judicial Stamp Paper of Rs. 10 will be prepared as a part of Affidavit. In which, Passport Size Photo of 3.5*4.5 cm, Name, Caste, Sub Caste, Religion, Father’s Name, House no., Village/ Mohalla, Tehsil, District, State, Father’s Name, House Number, Village/ Mohalla/ Tehsil, District, State whether unmarried or not etc. At the end of the affidavit, Signature of Candidate and Signature of Notary are mandatory to have. Complete Appendix A is dedicated to instruction for registration and submission of application – JCOs/ OR enrolment. Like other Indian Army Bharti Rallies, the application form for this will also be commenced from www.joinindianarmy.nic.in. Only medically fit candidates, who’ll qualify physical efficiency test and the physical standard test will be eligible to take the written test. 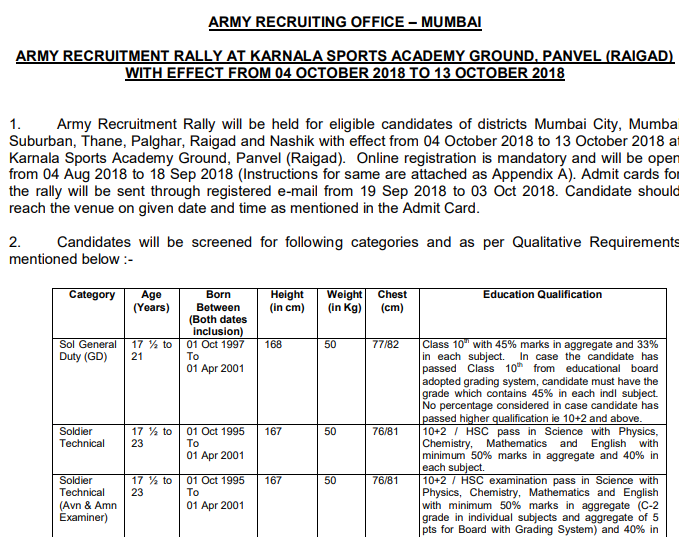 Admit Card for the CEE for the medically fit candidates will be issued at Rally site itself. Venue, Location, Date and Time of written test will be intimated at rally site and through Admit Cards. Admit Card for the CEE for the review fit cases will be issued after getting medically fit by concerned specialist/ specialists at MH/ CH/ BH. Nine feet ditch and zig zag balance will need to be qualified. Whereas, 60 marks and 48 marks will be given respectively for candidates who qualify in 1.6 kilometres run in Group I (uptill 5 minutes 30 second) and Group II (5 minutes 31 second to 5 minutes 45 second). Admit Card, Educational Certificate, Photograph, Domicile Certificate, Caste Certificate, Religion Certificate, School Character Certificate, Unmarried Certificate, Relationship Certificate, NCC Certificate and Sports Certificate, Affidavit, Single Bank Account, PAN Card and Aadhar Card. On www.joinindianarmy.nic.in, Result and Merit List will be announced for CEE (Common Entrance Examination). Before attempting the main question paper and at the time of practising question papers, solved papers etc, applicants should keep in mind the Negative Marking would be implemented in the Common Entrance Exam. For Indian Army Job Aspirants Facing Any Issues, make sure to visit ALLINDIAROUNDUP on a continuous basis. You can comment your query below or for more details, contact on telephone number: 022-22153510.